Have you made the move from slides to digital images? Or from audio tapes to compact flash drives? Do you think about how best to ensure the safety of these “born digital” multimedia files? They seem so ephemeral . . .
Until fairly recently, folklorists only had to deal with the preservation of tangible field-recorded materials. 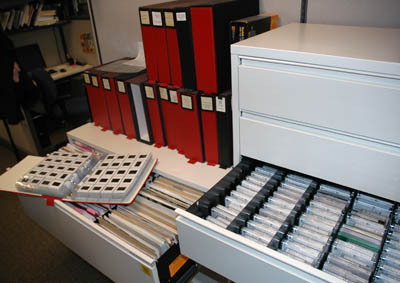 Here at the MCC, our traditional arts archive is primarily made up of physical things (negatives and slides, printed photographs, magnetic audiotape, and printed matter) that take up space on shelves or in file cabinet drawers. Best practices for preserving and providing access to these types of materials were established long ago (e.g., acid-free paper, climate and humidity control, archival sleeves for slides and negatives). But standards are still being debated for the preservation of digital objects. Advances in technology have brought us a whole new generation of affordable field-recording equipment which is smaller, lighter, and simpler to use. We can record an interview using a teensy digital recorder that captures sound on a compact flash card. We come back from the field and transfer images from a digital camera onto a computer or external hard drive, with no wait for developing or processing. The images and recordings are instantly accessible for review, editing, and posting on the web. Storage takes up much less physical space. Yet, when it comes to preserving these digital multimedia files, there is something unsettling about moving away from the physical film or magnetic tape. How do we ensure precious digital materials will be accessible over time? With issues of this sort on my mind, I was fortunate to attend a workshop on preserving digital multimedia files last week at the Vermont Folklife Center. In fact, folklorists around the country expressed their disappointment in not being able to attend. Andy Kovolos, the center’s archivist, shared tips on the basics of digital preservation, including file formats for storing digital photographs and audio, the challenges presented by digital video, and ways to keep good track of your materials. Multiple copies of files in varying formats keeps material safe. For example, store a recent field recording or photo shoot in several places: on a server, on two external hard drives, and on a CD. Don’t write on a CD! The top surface of the CD is susceptible to damage, not just the bottom. If you must, write with a water-based, permanent pen on the inner plastic circle of the CD. Avoid “sharpies” as they might interfere with the top (lacquer) layer of the CD. Store CDs in regular sized jewel cases, not fiberglass or paper sleeves. Store them vertically, not horizontally. Buy CDs in jewel cases, not in spindles. Migrate, migrate, migrate. Dale Hecker of Harvard University Libraries reminds us that “Digital materials are surprisingly fragile. They depend for their continued viability upon technologies that undergo rapid and continual change.” This is true for analog as well as digital materials. Afterall, who can use a floppy disc anymore, let alone play a wax cylinder or a 78 recording? If your archive is full of DAT (digital audio tape) recordings, as ours is, make sure you copy them onto the latest technology and back them up on a server. Scan slides and create TIF files as your preservation master files. Then create “use” files for editing, printing, and emailing. Metadata matters. It is important to include information about the information that has been collected. Describe the context, content, format, and authorship of the material. Who conducted the interview, where, and when? Is this interview part of a project or collection? What kind of camera, microphone, or sound recorder was used? What software? Is the material restricted in any way?